Joint filing has been a source of confusion ever since the filing status was created in 1949. Marriage has the potential to create a significant tax penalty, but it can also lead to a tax bonus in other situations, and for most taxpayers, determining the effect is anything but simple. Erratum: This chart, when originally published, was accidentally reversed horizontally while processing the image. We've corrected the error. To illustrate how filing status affects tax liability, we’ve created a chart (above) that plots the two most important variables against each other—on the Y axis, equality of incomes between the two spouses, and on the X axis, total household wage income. The color represents the theoretical marriage penalty or bonus for a household with only wage income, no children, and no itemized deductions. In general, there tends to be a marriage tax bonus when the two partners have widely disparate incomes and a marriage tax penalty when they have similar or equal incomes. There are two countervailing forces at work—on the one hand, the higher tax rate brackets kick in at greater income levels for joint filers than for single filers, but on the other hand, adding two incomes together can more than compensate for this effect. The need to balance these two effects is inherent in any tax system with a joint filing status—efforts to reduce the marriage bonus for certain filers will necessarily lead to a marriage penalty for others and vice versa. With disparate incomes, a bonus results, because the addition of a small income to a much larger one is usually not enough to lift the return into the raised bracket, but in other cases, the combination of two incomes of similar size can bring the return into the higher tax bracket even despite the generally raised bracket levels for joint filers. The strongest impact is therefore on two-earner couples. If a couple has one wage earner and the nonworking spouse is trying to decide whether or not to re-enter the workforce, he or she will need to consider the high marginal tax rates that will be levied on the second salary. Marriage penalties tend to affect low income and high income couples, but not middle income ones—low income couples because of the marriage penalty inherent in the structure of the Earned Income Tax Credit (EITC) and high income couples because the 28 percent rate bracket and above for joint filers begins at less than twice the amount for single filers. Middle income couples are much more likely to receive a marriage bonus simply because there is no penalty inherent in the bracket structure for the 25 percent rate levels and below—for joint filers, each bracket begins at exactly twice that for single filers. As with the previous chart, all examples assume only wage income, no itemized deductions, and no children. The graphic on page 1 above was created using code from Tax Foundation’s online tax policy calculator at www.mytaxburden.org. It is 100 pixels wide and 100 pixels tall, for a total of 10,000 pixels. Each pixel represents three runs of the calculator—once for each spouse individually and one for the joint return—for a total of 30,000 tax calculations. The income axis is logarithmic, and the left and right edges differ by a factor of 100 – meaning the income level for any given pixel is , or 1.0471, times the pixel to its left. The equality axis is linear, ranging from perfectly equal at the bottom to perfectly unequal (one spouse earns all income) at the top. 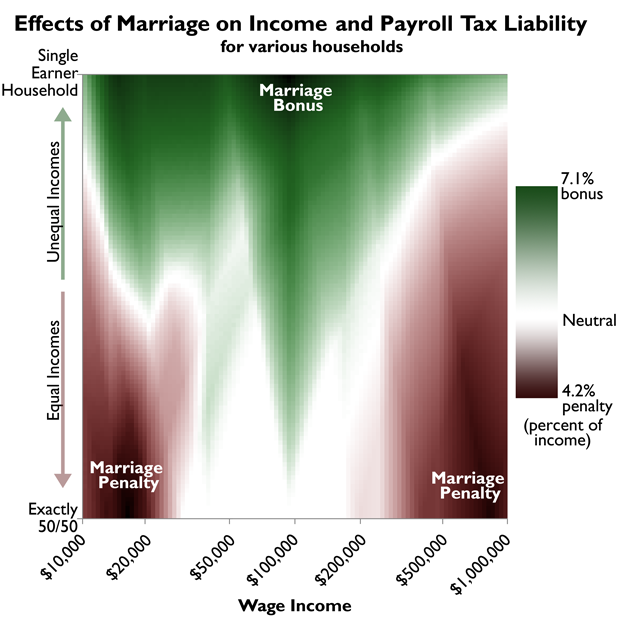 The calculated marriage penalty or bonus was divided by total wage income for a percentage figure, and the color scale is based on this percentage.